In keeping with the list-making that’s abounded during June, I thought that I’d share the 12 books that have had the most influence on me. Again, these are not presented in any order, but simply as they bubble to the top of my brain. 1. Lord of the Rings (J.R.R. Tolkien). For me, he is the fantasy writer par excellence, though it is not a title that he would wear comfortably. Many have argued that his characters lack depth, but each of the heroes has a double that reflects their potentially dark side. I read this every couple of years or so, and it always seems fresh to me. I was fortunate enough to visit Oxford last December. 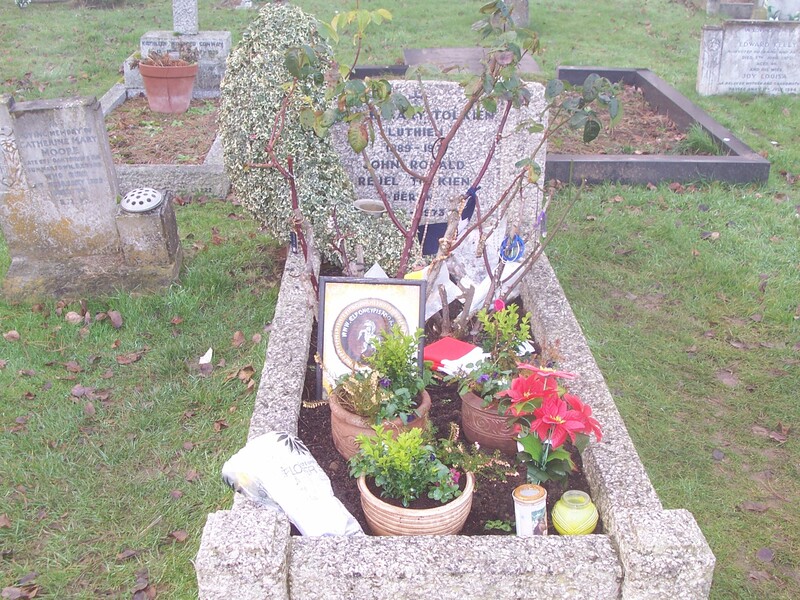 I visited the Bird and Child pub each day, and made sure that I visited his grave at Wolvercote. It felt to me like the completion of a pilgrimage. 2. The Dispossessed (Ursula le Guin). I got to read this in Year 12 for the HSC. It helped to kindle my interest in politics and science fiction (I wasn’t really a sci-fi reader at that point). 3. The Prophet Armed: Trotsky 1879-1921)/The Prophet Unarmed: Trotsky 1921-1929/The Prophet Outcast: Trotsky 1929-1940 (Isaac Deutscher). These three volumes constitute Isaac Deutscher’s monumental biography of Leon Trotsky. It is the finest example of the biographer’s craft that I have ever encountered. A meticulous scholar, Deutscher also wrote engaging prose. Deutscher himself was also an interesting figure. A Pole from a Jewish family, he became a member of the Communist Party of Poland in 1927. He was an adherent of the Trotskyist opposition in the 1930s, though not an uncritical one. He moved to the UK a few month prior to the outbreak of WW2. Like Joseph Conrad, he learned English relatively late in life and yet became a master of its prose. Deutscher became associated the the New Left in the 1960s before his death in 1967. 4. The Bible. Even for those who do not believe the claims made of it, it is an important text in its own right. So much literature is written with this as a reference point. From a literary and historical point of view this is an important text to gain some familiarity with. 5. I Claudius/Claudius the God/Count Belisarius (Robert Graves). I remember watching Derek Jacobi as Claudius in the BBC series, and I was given a copy of the books as a present. A few months later, I saw a copy of Count Belisarius in a second-hand shop and devoured that too. His ‘rehabilitation’ of the reputation of Claudius even today is not implausible, and the intrigues of the Imperial family are well-told. 6. Days in the Sun (Neville Cardus). Neville Cardus was a working-class boy from Manchester whose two great loves were classical music and cricket. He wrote for the Manchester Guardian (now The Guardian), and his rich prose captures the essence of his subjects. He is a master essayist, and gives us glimpses of a cricketing world where sponsor’s logos are absent, and where drama is allowed to unfold over days. 8: The Decline and Fall of the Roman Empire (Edward Gibbon). A magisterial history that not only covers the collapse of the western empire, but the successor states in western Europe, as well as the Eastern empire up until the capture of Constantinople by the Ottoman Turks in 1453. Though a good deal of his work has been surpassed by modern scholarship, it is still the single-most ambitious portrayal of Roman history from the first century to the fifteenth. 9: Asterix the Gaul (René Goscinny and Albert Uderzo). I got interested in roman history (and history in general) by reading these. They also taught me that good writing can legitimately appear in comic or graphic form. I also learned to appreciate word-play and puns from these. As good as Goscinny and Uderzo were, a lot of credit is due to Anthea Bell and Derek Hockridge for retaining the sense of the original. 10. Notes from a Small Island (Bill Bryson). Wonderfully dry and witty travel writer, Bryson is a native of Des Moines (‘someone had to be’), who has spent much of his life in the UK. One warning – do not read his work in a public place, unless you are prepared to have people stare at you as you constantly snort in mirth. 11. At the Barricades (Wilfred Burchett). Burchett was an Australian journalist from the 1930s until his death in 1983. he was the first Western journalist to arrive in Hiroshima after the Japanese surrender in WW2, and penned the famous lines ‘I write this as a warning to the world’. He was also in a long-running dispute with the Australian government in the 1950s and 60s when they refused to issue him a replacement passport after it went missing in 1955. I could also substitute any of John Pilger’s works for this one, but Burchett gets the gong simply because I read him first. 12. After Dark (Haruki Murakami). I read this only a few month ago. picked it up by chance at work 9I was waiting for a group to arrive for an infolit session). I’ve always liked Japanese literature, and this was short, which fitted the bill. I found the sparse prose absolutely captivating. I’m grateful for my predecessor for adding it to our collection. it was a wonderful find. There are a lot of titles that might have made it here. The corpus of Shakespeare’s works come to mind, though I prefer to see them acted, rather than read them. Mervyn Peake’s Gormenghast novels also deserve a mention. The wry, Gothic constructs of Peake’s mind is terrifically absorbing. Or the novels of Poul Anderson. If the list were 15, then Victor Hugo’s Les Miserables would enter. But I have to stop somewhere, and this is as good a place as any other. The internet is big. Really big. You have no idea how amazingly, mind-boggingly big it is. You may think War and Peace is a big read, but that’s just peanuts to the internet (cue Douglas Adams engaging in grave-rolling type activities)….. So much on-line content is now created, because anyone can create on-line content. Information was once scarce. Information was hand-written onto scrolls, codices, and later printed into books. The rate at which books have been published has gone up markedly over the last decade as printing techniques have become more automated, so even in the traditional printed realm we are drowning in information. Libraries, like all gatekeepers depend on a relative scarcity of information to thrive. Libraries were important in the ancient world as a means of disseminating and as a means of preserving information. In order to make sure that everyone could access that information we (libraries) controlled who could access it, and for how long, which depended on who provided the funding (the local city council, a university, a law office, a school). We were on the whole good at it, and rightly proud of what we could provide. But what happens to gatekeepers when the gates can be bypassed? So a person with a computer can access information on most kinds of things. Not everything: everything is not yet on-line. But enough to be getting on with. So if the body funding the library decides to ditch the books, what happens to us, the library staff? It won’t happen, I hear you cry? It does, and has. For example, this, and this. Now, is that wise? Well, maybe not necessarily, but if things move that way then thery need to be dealt with, rather than simply decried. I wonder whether decisions to take books out of school libraries might be resisted more strongly in Australia, but if educationn trends move away from the printed page then fewer books in favour of more digital (and importantly, more interactive) stuff is going to happen sooner or later. What then is the library’s future long-term? I think that libraries will still be an important part of the community in my lifetime, but in historical terms we are I think on the cusp of a new era. I’m reading a fascinating book at the moment which touches on a lot of this stuff, which I’ll share over the next few posts.